Royal Air Force Fleet Air Arm issued wristwatch. Made only for military duty. Dial painted with phosphorus. This is one of the more unusual military watches I have come across. 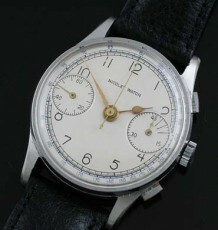 Most watch collectors have come across the purpose built made only for the military Lemania single button chronographs. This is a rare variation that model. 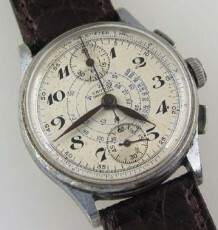 The case of this watch is the same as the other models issued in the early 1950’s. What is different is that it has a white dial and instead of having tritium luminous or no luminous at all, the dial is marked P in a circle. This signifies that the the dial uses phosphorus as a luminous compound. 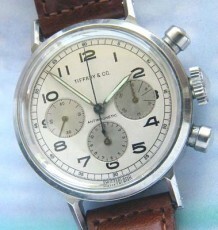 During the 1950’s and 1960’s some manufacturers moved away from Radium to use non radioactive Phosphorus on watch dials. The movement in the watch is the famed single button chrono movement calibre 2220. 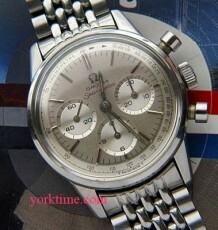 This movement was also used by Omega in their Royal Canadian Air Force issued models. The watch has been fully serviced and is functioning flawlessly. 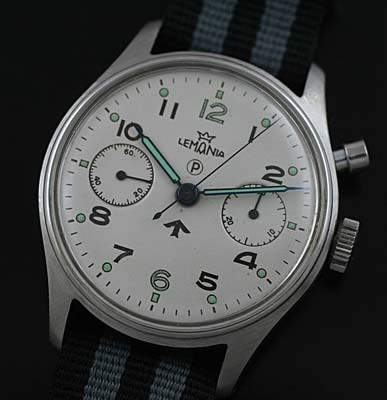 The all steel case measures 40 mm wide by 45 mm long and is supplied on a “Bond” Nato strap. The watch carries the original military Broadarrow mark on both the dial and the case back. The branch of the service this watch was last issued to was the Royal Navy Fleet Air Arm as indicated on the back. The watches were utilized by navigators on these aircraft.